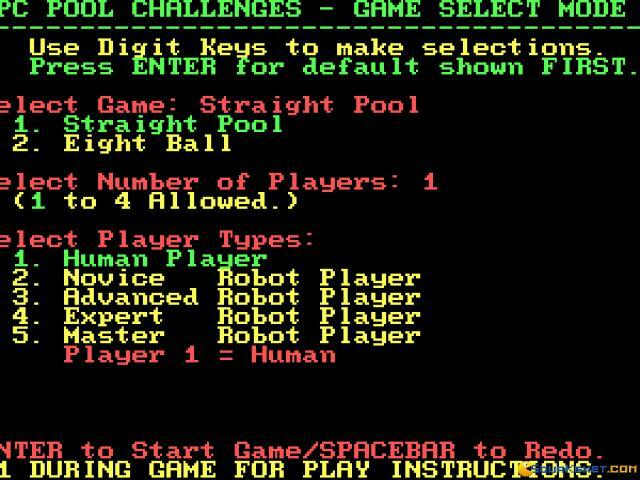 For a gale this old (released in 84) to be so physically accurate and also to have so many customization options, it almost seems unlikely, yet PC Pool Challenges offers all of these. 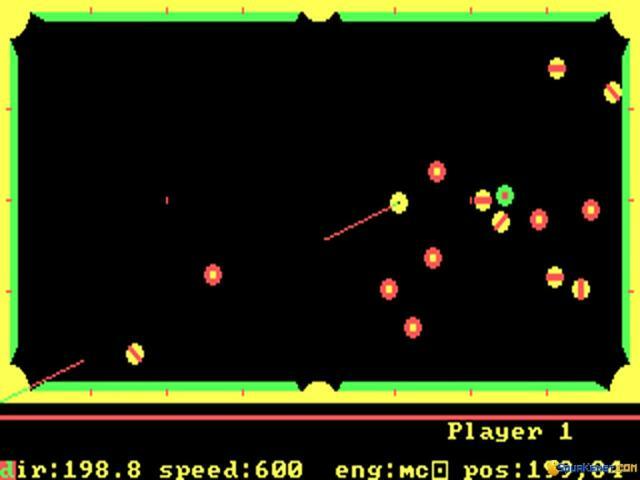 There are two pool games that are simulated: classic 8 ball pool and a game of snooker. 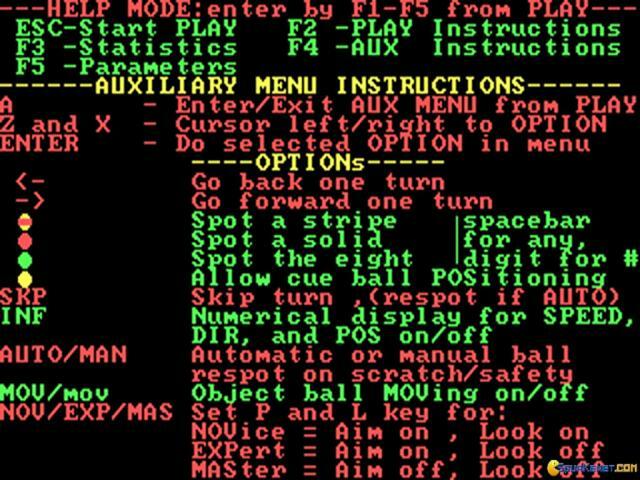 The control offers you the basics, but also such staples as applying English to the cue ball, establishing the direction and the speed of the cue with lots of accuracy and much more. 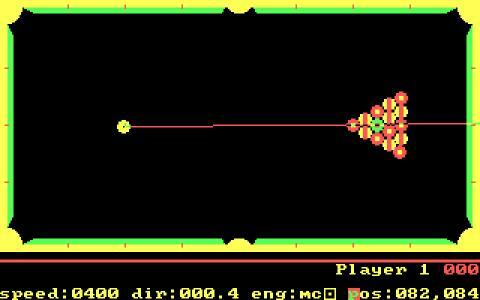 Graphically, and only graphically does PC Pool Challenges show its age: it's on the lesser side of DOS 8bit style graphics, only seen from above, yet accurate and playable. 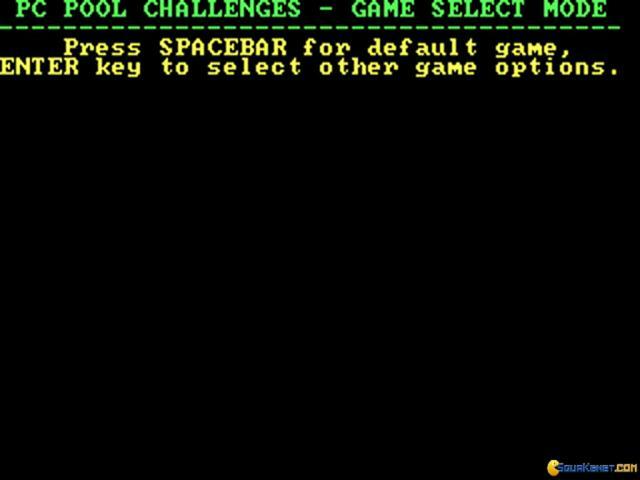 Heck, it's so old that the table isn't even green, but black, and the mantles are a shade of yellow! 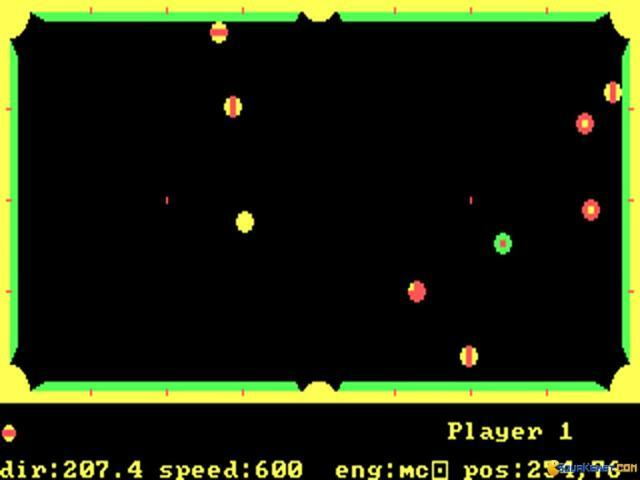 But, since you can play with up to 3 other players, digital or real, and you can customize ball friction and rail bounce, and a couple of other aspects of the game, you can really look at the game as a sort of pool sim, with the controls offered to you on so many levels. 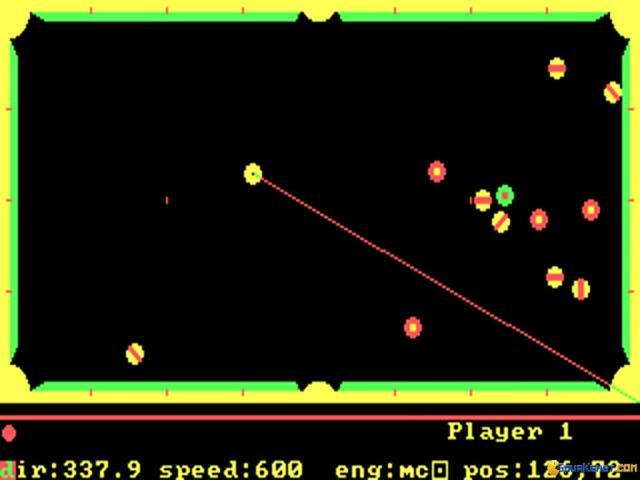 Great game, as is Pool Shark, one of the greats of the late 90s. 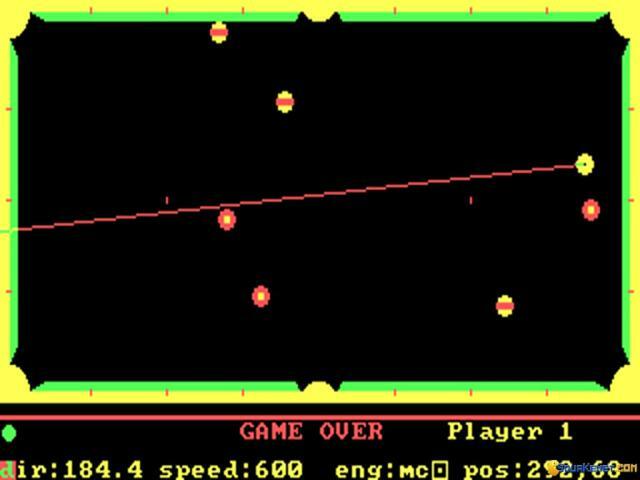 PC Pool (1984) is a very simple 2D pool simulation that has enough playability to be worth a visit, yet it isn't too original, even when judged by its age. 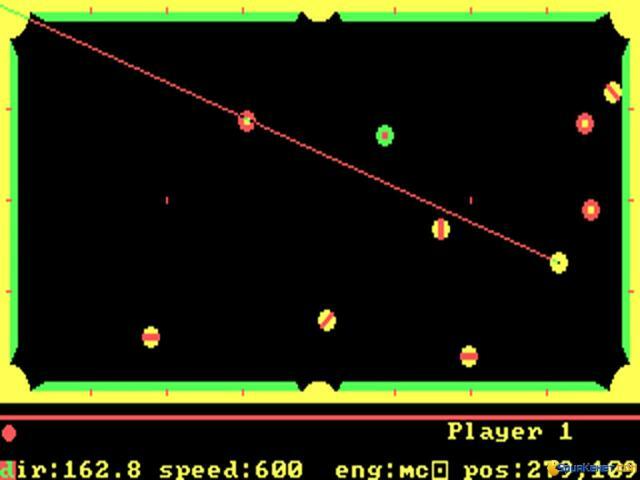 So, what you get is a top down pool table, and a number of players to play against; you can choose to play 8ball and 9 ball pool, and depending on your adversary, you will get a more difficult or a less difficult game. 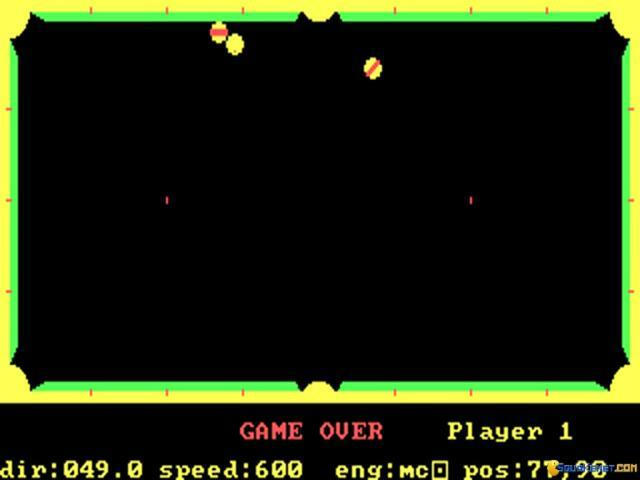 The physics are accurate enough; particularly the deceleration of the balls after the cue ball hits is not as well produced, yet, for all intents and purposes, given the very pixelated nature of the game, and the fact that the pockets are larger in reality than pictured (the ball will enter even if it looks like it hits the mantle). 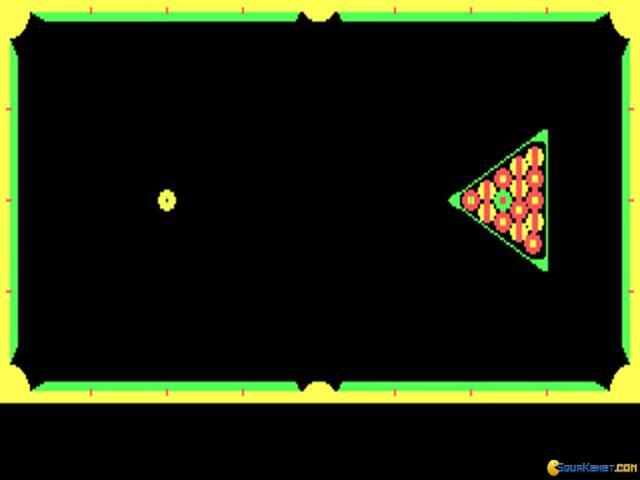 Style wise, PC Pool looks clean, without any additional ornamental details: you can see a cue and the orientation line (extended to the first ball you will hit, if you want extra control of the game) and, for the most part, it all looks alright, maybe a little too pixelated I'd say. 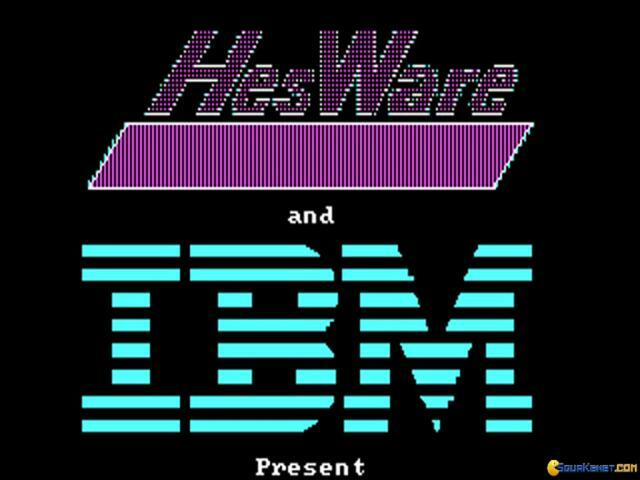 Try it only if you want to play a particularly retro pool game, else download Virtual Pool, still an oldie, yet much more graphically endowed.